Sorry for the error in my previos post: delay of 16 cm, but not 16 msec, of course between left and right channels. Correct me if I am wrong, but you are required to purchase a measurement software separately from the hardware? Also, did you set time, XO via DSP prior to using the APL1? Btw. Alex - Raimonds informed me about the c1 peq software, noticed the folder contained 2 executables just now. So I do have the delay program, I'll try it out as soon as possible. I have a few other tests I wanna try as well. Would be interesting to see an analysis of the *.fir file generated. Perhaps MATLAB can analyze that? I currently have a Helix DSP, but have plans to upgrade to the pro very soon. This sounds like a very nice product, but very odd, to me, why the software isn't included. APL Workshop software generates minimum phase equalizer filters by default. You can switch on a generation of linear phase filters for some scientific purpose. But there is no practical reason to do that because of nice properties of minimum phase correction that is doing correction on amplitude as well as on phase. It is almost impossible to have useful information from on point („listening position”) measurement (TDA measurement (Quested example) is exception). Please find attached two pictures: „listening position” measurement and power response measurement of some studio monitor. The rotary 16 position preset switch for APL1 can be installed anywhere in a car by use of an unshielded 5 wires cable of any length (flat cable, cable for security systems). The APL3 is simple stack of 3 PCB of APL1 to save a space. The new version of an APL1 thin stainless steel enclosure will allow stacking APL1 as it is to get more processing channels. I have looked around and I haven't seen any prices for the hardware yet. The APL Workshop software and APL1 unit are set of two products for solving equalizing tasks in different environments. You can use APL Workshop just as measurement tool or with software equalizer – VST plagin APL EP1. 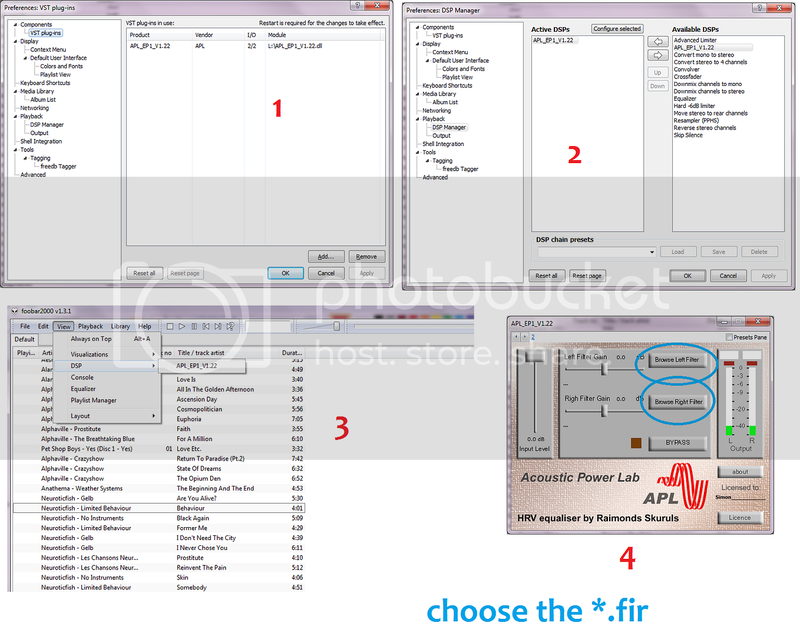 You can use just APL1 unit if you are able to generate FIR filter yourself. It supports wav format FIR filter coefficient files. You do not need to purchase more than one copy of APL Workshop software if you are representing tuning studio and installing lot of APL1 units. You do not need to analyze FIR filter generated by APL Workshop because the yellow curve already represents it fully. The FIR filter file format used by APL is proprietary, closed format. I can convert it to any specific format you like on order. Anyway, please feel free to ask me more questions! So is the APL3 discontinued? Or is it the same price as 3 APL1's? Ok. Then I won't attempt to read it. One question, the other files... the . *DAT which can be opened in notepad. What different data do they represent, I assume that PR is power response. APL3 is still available on order. It costs little bit more than 3 APL1 due to specific production. I was the one that had troubles with the VST plugin. Thanks Han. I figured out what was going on. I didn't have a VST plugin drop down in my components like Han does in the example above. I originally thought you just put the APL VST plugin into the component file of foobar but foobar wouldn't recognize the plugin. I finally figured out I needed a VST plugin just to be able to load the VST for APL that's called (Foobar 2000 VST 2.4 adapter). Now all is working well. I was looking at the flat response curve and how it was able to remove the null. If a null is caused by certain frequencies cancelling each other out (I guess that is the opposite of a resonance frequency), then how does it adjust the level to counteract that? It fixes areas which are minimum phase. So phase cancellations between drivers will not be much of an issue. Modal dips can't be EQed, but you can lower the adjacent frequencies to gain a 'flat' response. Doing it this way will cause a higher demand of power at the modal dip though. In my example there were major peaking at 100Hz and 50-60Hz which made it look worse than it was. .....and since you're now attenuating a range, everything else will need to fit in with this range to keep tonal balance. Each null that one addresses means you're cutting across ranges. All correct. High Q (narrow) dips/peaks are less audible than low Q (wide). Overall response (summed) isn't THAT important to get 100% either, this is responsible (no pun intended) for overall tonal balance. The L/R response however is far more important as it largely dictates how the system stages, here we have far more use for an accurate 'multipoint' FIR EQ. Any dip or peak that isn't consistent from left to right channel will cause the stage to either side. Same with absolute phase, which is inaudible. Relative phase is not however. Having phase correction (phase EQ) is invaluable in the ITD-range (below 1600Hz or so) because it can keep the center/staging calm even if the relative group delay (magnitude/phase relation) is off. Since APL does all the corrections automatically the amount of EQ you want/need to adjust yourself is not that big actually. I found 2 or 3 areas in the initial run of APL that I manually applied some minor correction to. By all means, this is far less than I usually correcting for when fine tuning after measuring using the 'traditional method'. The more I read about the details, the more I realize that I don't quite understand. I am going to download the plugin and see what I can do with it. I have a laptop with foobar, a Dayton Audio iMM-6 Calibrated microphone, a head unit that has a line level input and the soon to be downloaded plugin. It there anything else I need? Both yes and no. If 1 ms at normal atmospheric pressure corresponds to appr. 34 cm (little bit more, indeed), so you are right. You can backup fir-flter with the max delay of 4,797 ms. It will be a new filter: ***-fir_4,797ms. Then you can use this new file to delay it further. New file name will be: ***fir_4,797ms_4,797ms. I mean that the last one has a delay of 4,797 x 2, which is about 350 cm. I can not see any restrictions for this process. Going to ask Raimonds about this issue. I'm now trying to tune my front again as some things have been changed (HPF, LPF, crossover frequencies and the most important - frequency response of the both fronts). If I would still use old APL-corrections made onr year ago, the sound will be more bright than necessary. I will for sure make some tests of the delayed files with TDA software. Regarding time alignment, phase control etc. - to my opinion the majority of people underestimate its importance as they think it is not audibe. I could easily hear the stage center moving by just applying different delays between left and right speakers. It is kind of rotating image, which has its own optimal position. Do not forget about midbass and sub. For some complicated subs it is required quite siginificant optimization ion the time domain (much more than 5 ms). Try to spend your time analysing results of tests with TDA - sure you will be surprised. By the way, the latest version of this soft: TDA 9.0 gives you even more information - distortion analysis. When you open graffs in TDA, it is possible to use a cursor for determination of exact values needed to be corrected. APL's accuracy is rather high (compared to fx. min. delay steps in my HU - 0,1mc (3,4 cm)). If correcting for group delay in the subwoofer frequencies, we either require channel independent delay (not possible with 2ch), which means more than 1 board of APL. Except the APL software... that's it. The APL Workshop measurement is showing only "real" dips (not caused by interference) and we must deal with them by ordinary means but not with a direct equalizer use at first. We should try to find real problem causing that dip and remove it by basic tuning. Usually such dips are caused by improper crossover tuning (including out of phase). And they are non minimum phase. The correction of non minimum phase problem (do not have ringing in its impulse response) with minimum phase equalizer (will have ringing in its impulse response) is not the best to do. Only in the case when we can not do anything with a basic tuning we should use an eq. And we may need to reduce a deep of that dip by 2 times (manually) to get best audible result. That was tested on problematic studio monitors where crossover bands did not overlap as needed - simply did not reach each other making huge dip at 1 kHz. Yes, but it is based on TDA measurement and must be aplayed “manually” (no ready to use tool) after all work on “amplitude” is done. Does it mean that if there is a dip of -10dB, correction for avoiding it will be -20 dB for the best results? An issue about use of two soundcards ( one for playback, another for recording) become actual. Two different clocks are working in such case. And we will have time compression or expansion in our measurement data that depends of which clock is faster. Therefore the actual set of soundcards must be tested for that issue. APL Workshop Impulse Response tab is drawing all IRs in one graph. All of IRs must be on 5 ms with they max spike. In case of time compression or expansion we will see IRs covering some time interval. It is ok if this interval goes under window (green curve). If no, we have a problem. The workaround for this is to accent first or last measurement (put the microphone more closely to the speaker/tweeter) that depends which clock is faster and you must find it by an experiment.